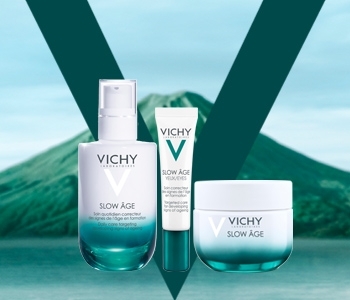 After 9 years of research, Vichy introduces Slow Âge, a powerful probiotic skincare range with SPF protection, clinically proven to slow down the ageing process. The Vichy Slow Âge collection harnesses the power of Baicalin, a rare flower that flourishes in the harsh weather conditions of West China. Vichy scientists recognised the flower’s antioxidant potential, to help protect skin from ageing oxidation, UVA and pollution. Designed to strengthen, protect and keep skin looking healthy and youthful, the Slow Âge line-up includes a lightweight fluid, nourishing day cream and regenerating eye cream.